The company began its activity in Bilbao in 1967, focusing on public works machinery, hot air generators and industrial HVAC installations. It later evolved towards the manufacture and installation of booths/furnaces for the automotive sector. Thus, to consolidate its position in the market, it began the implementation phase of large paint spray booths for the industrial sector and installations for surface treatment. It currently has more than 2500 references in over 30 countries, and it offers a holistic solution in all the stages of the paint and surface treatment lines implementation process: design, engineering, manufacture, assembly, marketing and after-sale service. Those first customers that installed GEINSA equipment not only remain loyal to the products of this make in 2017, but their relationship, which started off as a commercial one, has turned into friendship over the years. Currently, many of these firms have up to nine GEINSA installations: Lecitrailer, Sala Group (Seat-Audi-Volkswagen), Caf, Fagor, Jaso Group, Hune, Indar, PPG. Likewise, many customers have placed their trust in the firm on repeated occasions: Ulma Group, Técnicas Industriales de Decoración (TID), SFPI, Gamesa Group, Gestamp, Dacero Group, Gonvarri, Société Nouvelle Rossignol, Euskotren, Talgo, Renfe, Thyssen, Sunsundegui, Alstom, Kider Group and others. 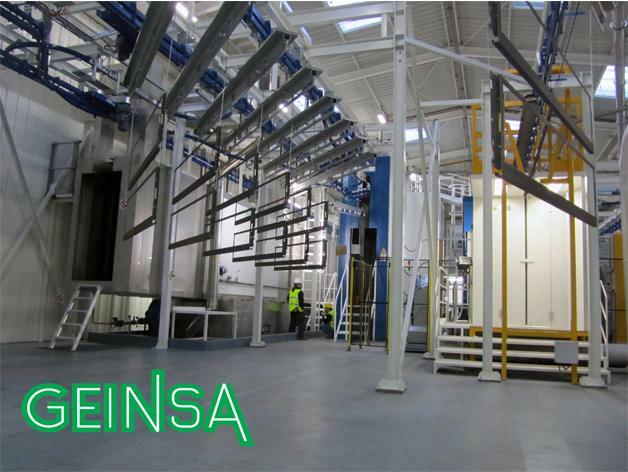 In the area of surface treatment, Geinsa has developed paint lines for a variety of industrial sectors and has contributed to optimising and improving their product finish, applying the most advanced technology provided by the GEINSA innovation laboratory. At a time when quality plays a fundamental role, it would not be fair to not mention one of the main strategies that have led to the personal and professional growth of all the members of the GEINSA team: efficiency and quality. With that dedication to quality and new technologies, certifications and technical acknowledgements, such as ISO 9001, ISO 14001, have been obtained, as well as numerous guarantees to constant innovation. Thus, GEINSA looks to the future by reinforcing that commitment to professional, and above all human growth, which is one of its more prized values.